Do you sit at a desk all day? That’s actually a health hazard. One study shows that unless you move at least five minutes every 50 minutes, it poses a health issue. Why not start exercising by making it part of your work day. Get up every 50 minutes, stretch, walk around the office or up and down the stairs. Any movement increases your exercise and helps you get healthier. There are even short workouts you can do at your desk. There’s no equipment necessary for walking. What have you got to lose? It doesn’t cost anything to walk more and it’s excellent exercise. While you don’t get a full body workout that sculpts you, it’s a start. Can’t fit it in your schedule? Maybe you can. Walk to lunch at noon. Rather than take the car for short trips of a few blocks, walk. Get up early and walk or take a walk when you get home from work. Do both all of the above if you can. Breaking up your walking to ten minute sessions still counts. Try a four minute workout. I’m fascinated by Dr. Bush’s four minute nitric oxide dump and the seven minute workout. That’s because they don’t take very long, but they boost the amount of exercise busy people can fit into their schedule. It doesn’t have to be four minutes, seven minutes, a half hour or longer. In fact, doing three 10-minute workouts throughout the day is best if you’re breaking it up to smaller, easier to manage sections. Get a personal trainer or start a formal program on your own. While it’s much easier using a personal trainer, since he or she creates the workout, just getting started is what’s important. Schedule a time three times a week to workout and start making it a habit. 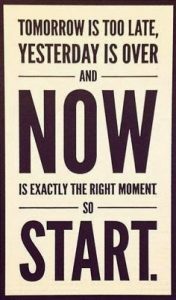 Start now, as soon as you finish reading this! You can do some simple body weight exercises at home to get started. Don’t procrastinate. There’s always a reason why you can’t exercise. Start focusing on the reasons why you can. Winners keep score. Write down the exercises and how many you do. If you choose walking, write down the distance and number of minutes you walked. Any type of exercise can be turned into an HIIT workout where you give it your all for a short period then have a short period of moderate exercise and back to giving it your all. Try it with the exercises you chose. It gets you into shape faster. If you’re not into regular workouts, try something different. Take up an active sport or take dance classes. Exercising doesn’t have to mean a trip to the gym. It’s anything that boosts your circulation and gets you moving.